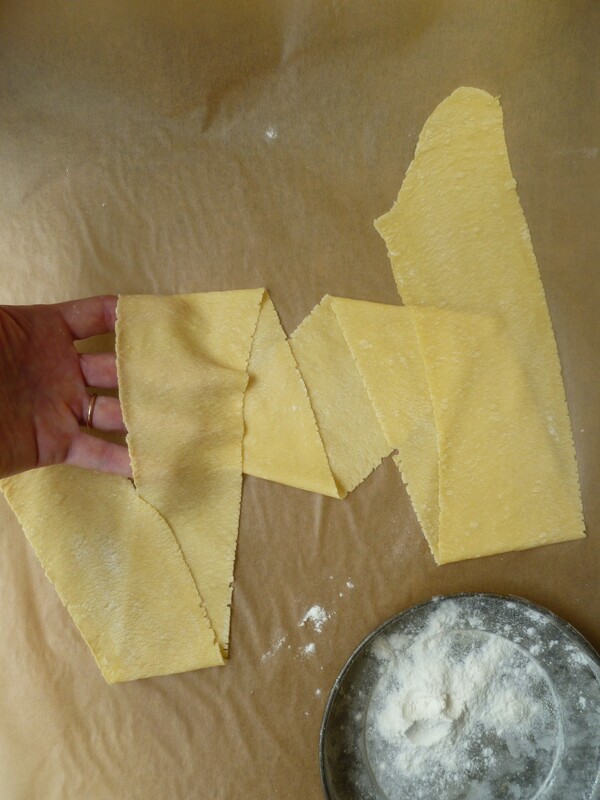 If a recipe for homemade pasta is too intricate, pasta making can be only an occasional project for the occasional day of unfilled hours and leisure to putter. 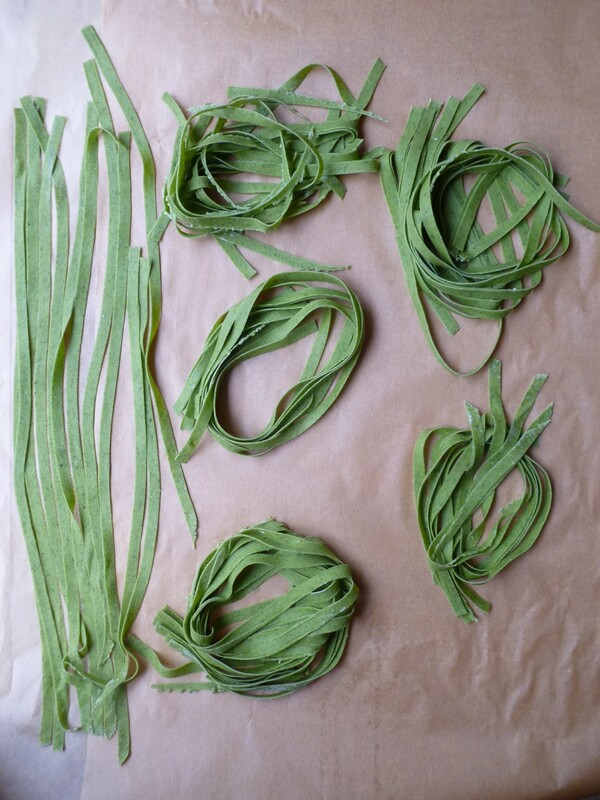 Here is a streamlined version of Giuliano Hazan’s excellent, practical method for making pasta at home. The way is simple and the result is exceptional. 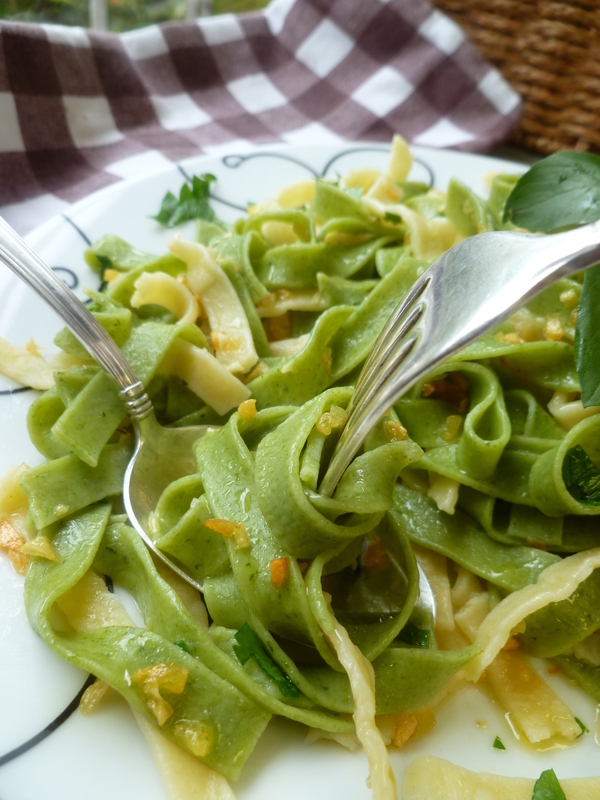 The finished uncooked pasta may be frozen, so that, with a little planning, one may enjoy the very best quality of pasta at home on a regular basis. 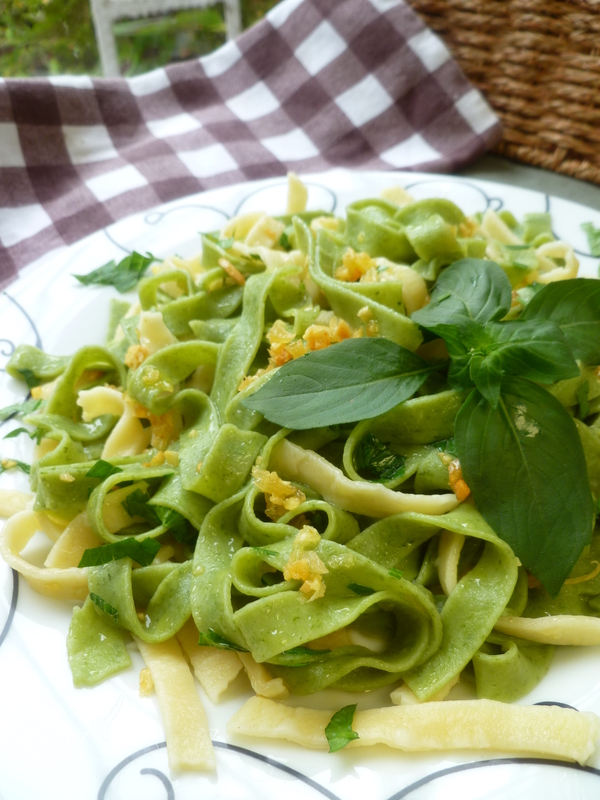 A Timing Note: The fresh pasta dries overnight before it is cooked and tossed with the garlic and parsley. a Pasta Machine: There is a link at the end of this post to a video series on making Tagliatelle without using a machine. 1. Put the flour in the bowl of the food processor, fitted with the chopping blade. 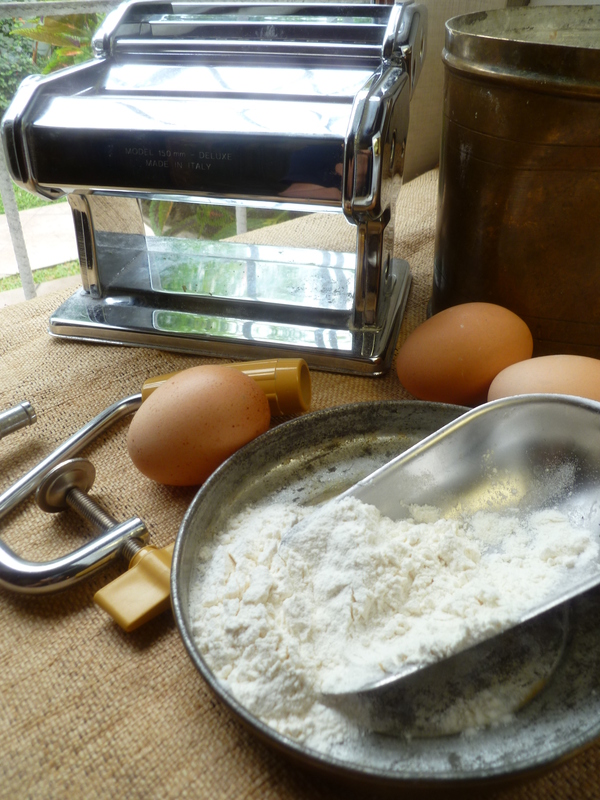 Turn on the processor and pour the beaten eggs through the tube into the flour. Hold down the top of the processor firmly as the dough forms because for it may pull against the blade with some force. 2. 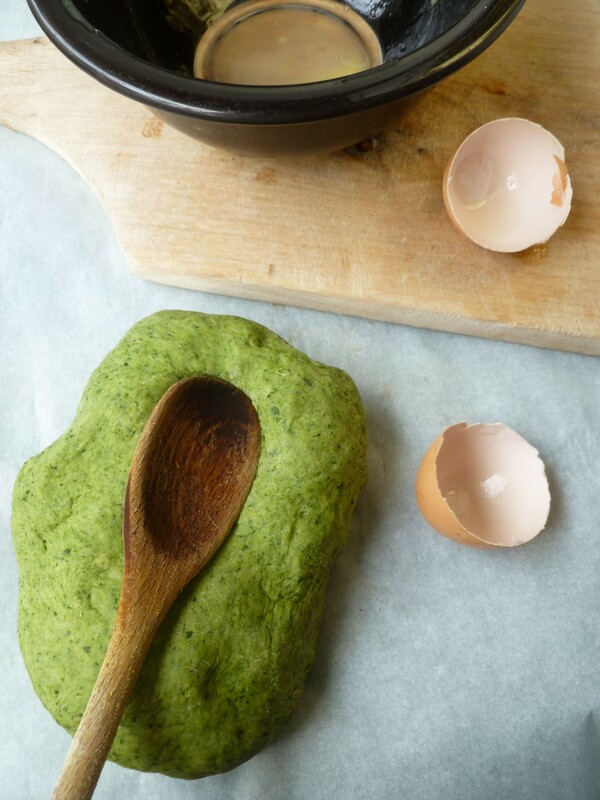 As soon as the dough leaves the sides of the processor bowl cleanly and forms a ball, turn off the processor and turn the dough out onto a lightly floured pastry board. The dough will be a bit sticky. Knead it a little until it loses its stickiness, but still feels moist–for about a minute or two. 3. 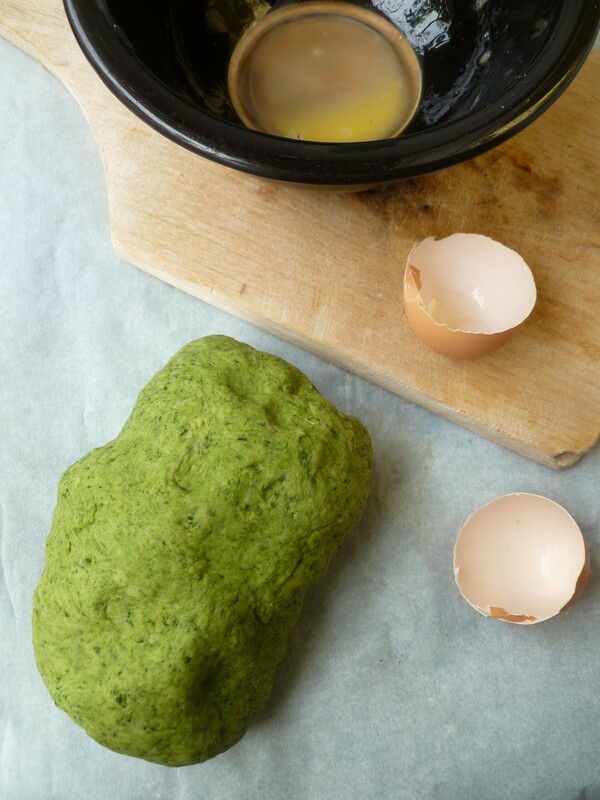 Divide the dough into as many pieces as there are eggs in it…in this case into 3 pieces, each weighing ’round about 6 ounces (180 grams, more or less). 4. Set up the pasta machine on a counter or work space. Set the rollers on the lowest setting. Cover two pieces of the dough with a slightly damp cotton kitchen towel. 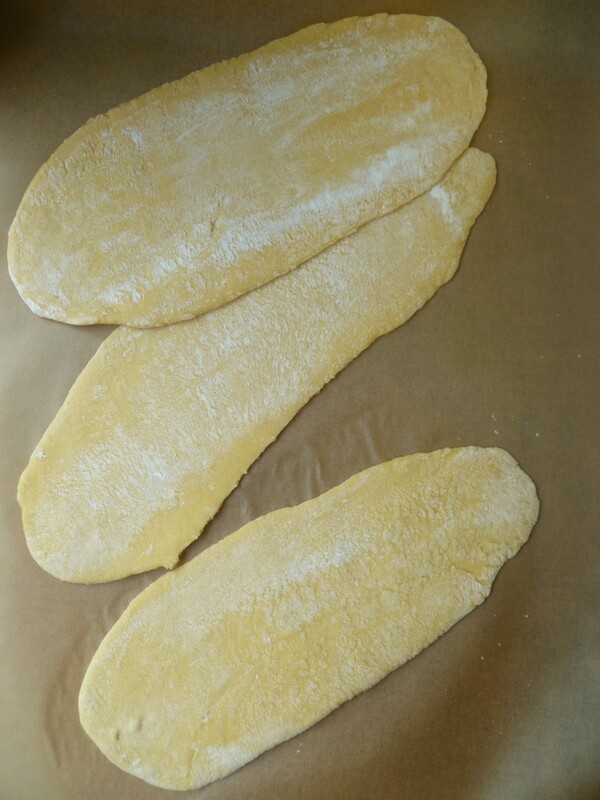 Place the third piece of dough on a lightly floured pastry board and smooth a little flour over the surface of the dough. 1. Cook the frozen or fresh spinach in salted boiling water for a couple of minutes. Drain it, cool it, squeeze it as dry as possible and chop it up very fine by hand or in a processor. 3. Set up the pasta machine on the counter or kitchen work area. 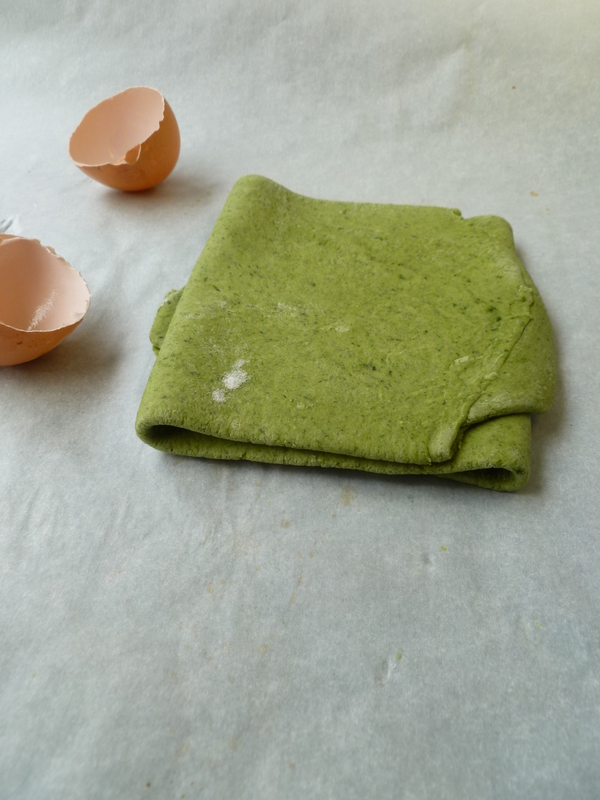 Divide the dough into as many pieces as there are eggs in it–in this case, into 3 parts. 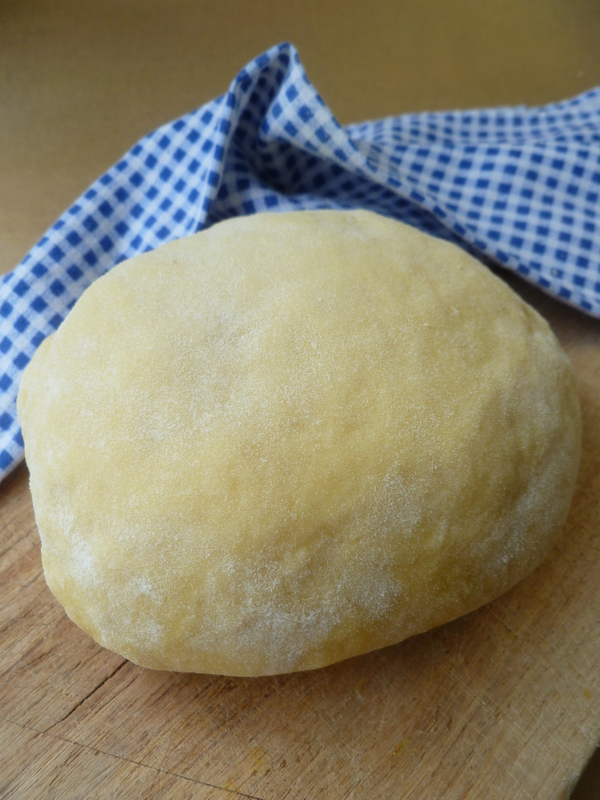 Cover two parts of the dough with a slightly damp cotton kitchen towel. 4. Place the third part of dough on a lightly floured pastry board and smooth a little flour over it. 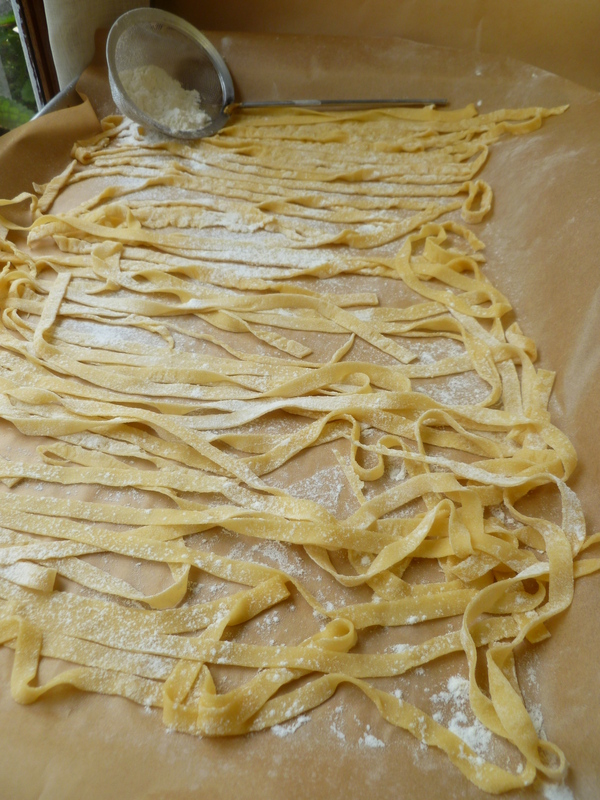 Set the rollers of the pasta machine on the lowest setting and feed the dough through them. 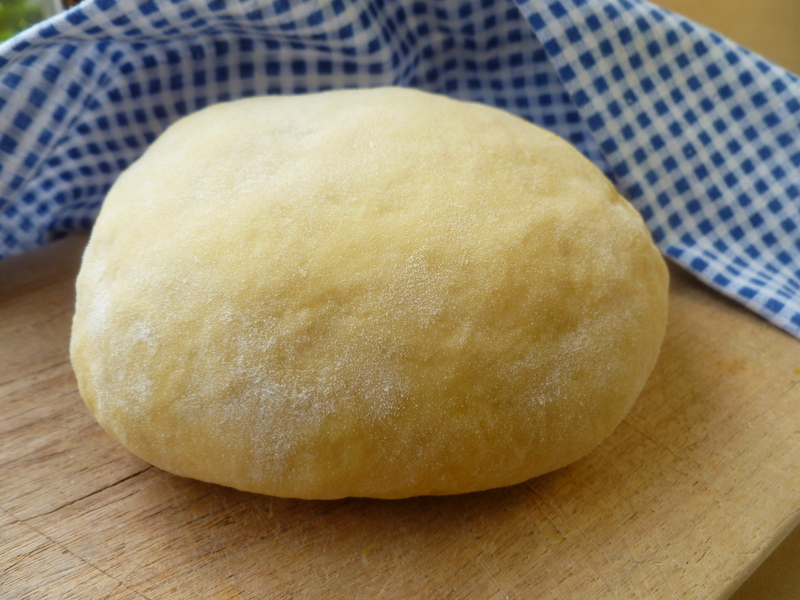 Rub a little flour over the surface of the dough if it begins to stick as it goes through the rollers. 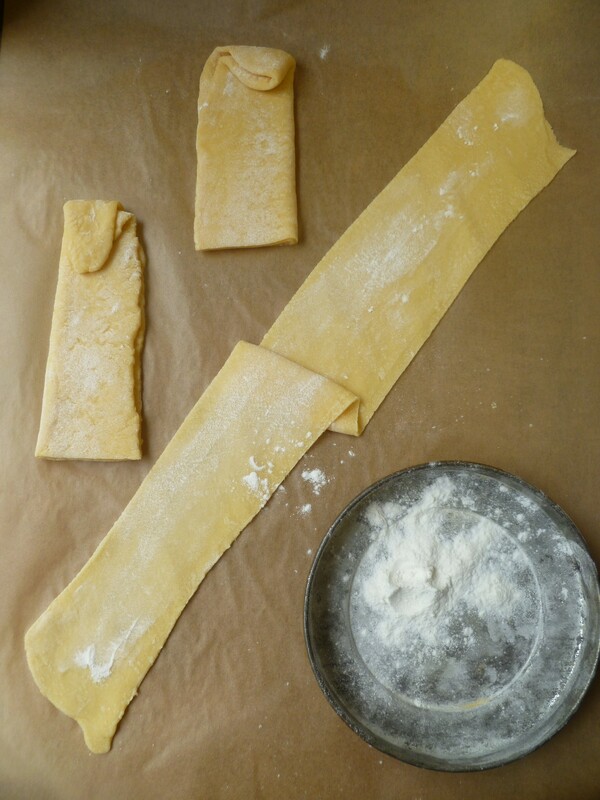 Put the strip of dough through the rollers set on the lowest setting 3 times. 9. Use a small strainer to sieve a little flour over the noodles. 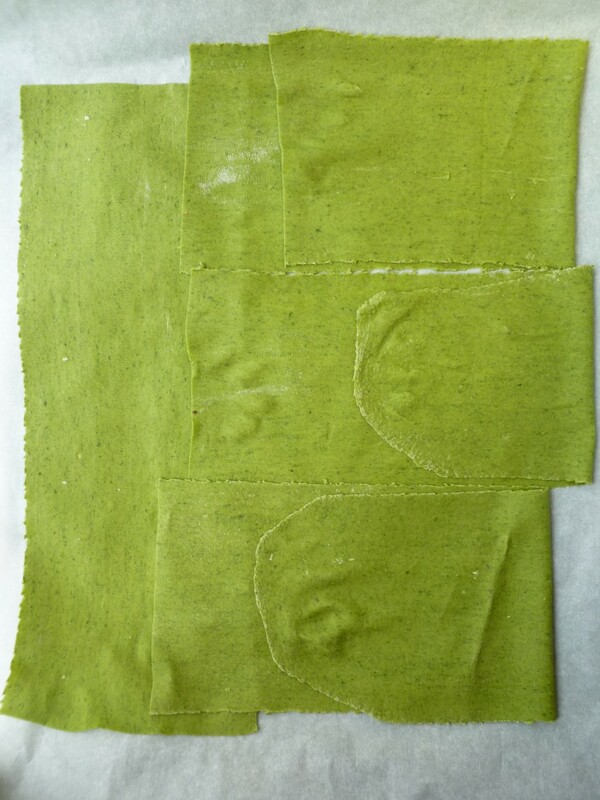 Cover the pans of pasta with cheesecloth and dry them overnight–preferably in a cool, dry place. a large Pot, sufficiently large so that the pasta is not crowded as it cooks–crowding might cause it to stick together. 1. Melt the butter and olive oil in the pan over medium heat. Add the minced garlic and brown it, stirring, until it begins to turn golden. Remove the pan from the heat and continue stirring the garlic around. It will continue to colour and crisp. Set the pan aside while the pasta cooks. 2. Fill a large pot with salted water, add a little olive oil to it and bring the water to a rolling boil. (Since the pasta is mixed with butter and oil, putting oil in the pot won’t prevent the sauce from adhering to the noodles.) If the water is boiling vigorously when the pasta added, the noodles will be less likely to settle on the bottom of the pot. 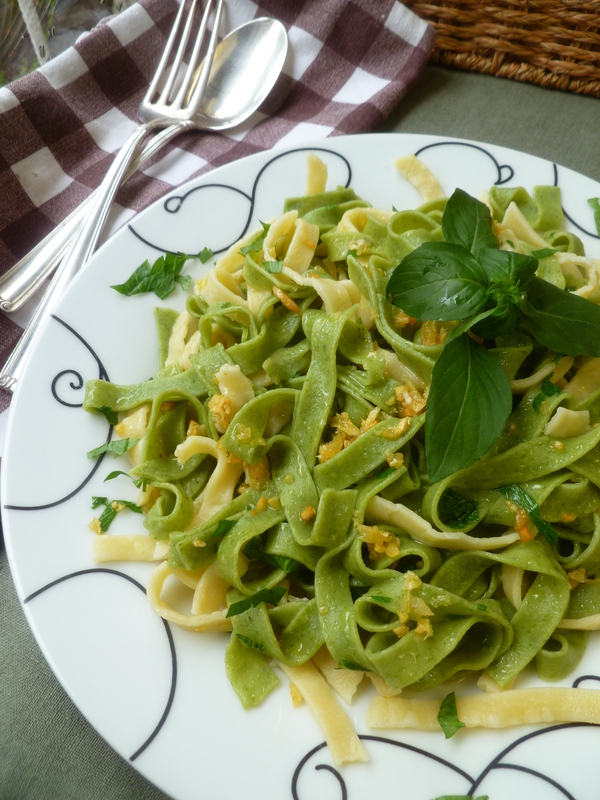 Cook the tagliatelle for about 7 – 8 minutes. 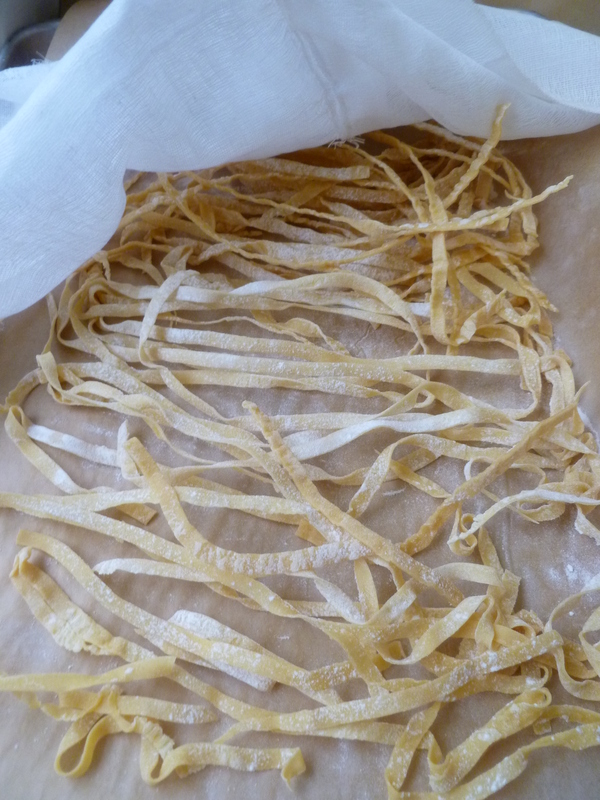 The pasta is done when there is no longer a white core in the center of a noodle but it is still a bit chewy…i.e. not soft through and through. 3. Drain the pasta well in the colander and toss it with the garlic, butter and oil in the pan in which the garlic was crisped or mix the pasta with the garlic sauce in a large bowl. 4. Mix in the chopped parsley. Taste and add a bit of salt. 5. Divide the pasta among plates. Garnish with a small branch of basil if you want and serve right away. 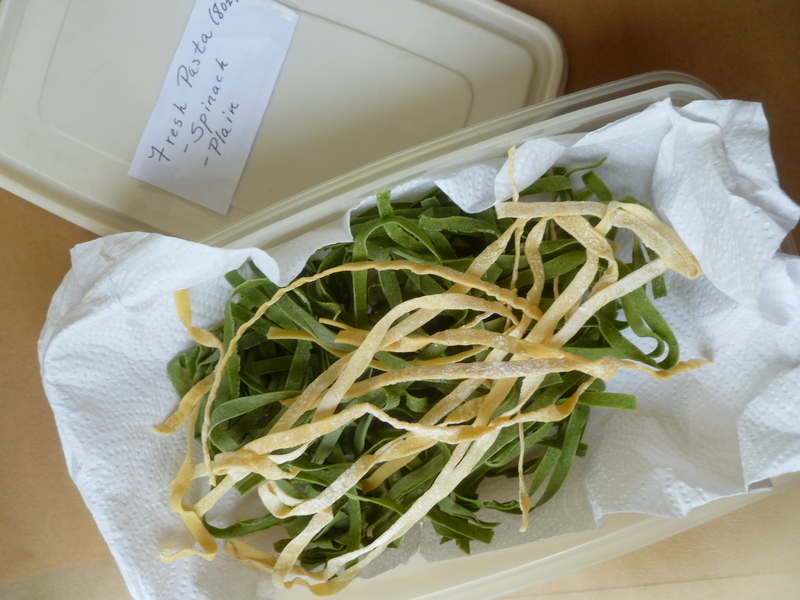 A Note: Hay and Straw tagliatelle tossed with Crisped Golden Garlic and Flat-leaf Parsley is served with the Main Course of the Lunch Menu: A Cold Winter’s Day Luncheon Reminiscent of Sunny Climes. 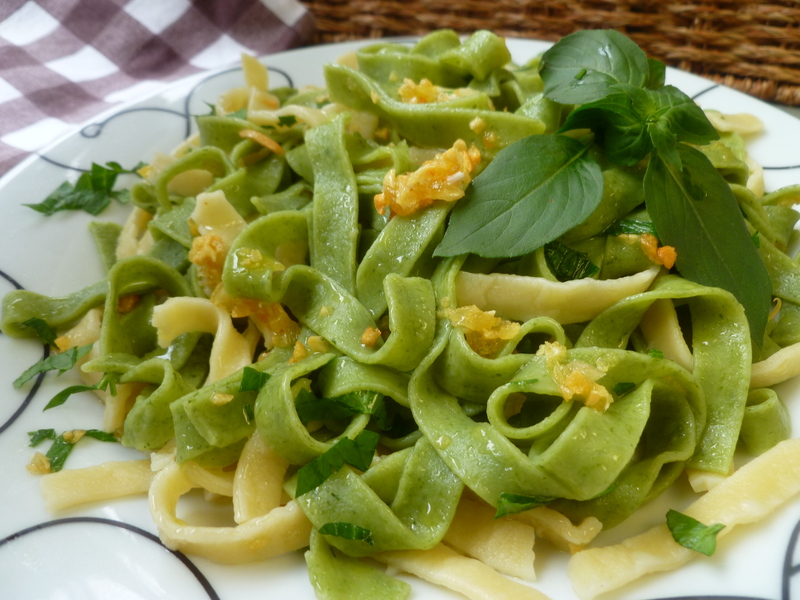 The dk’s method of making pasta is adapted from one in Giuliano Hazan’s book How to Cook Italian (2005). This portion of the book is also exerpted here on his blog ‘Educated Palate’ . 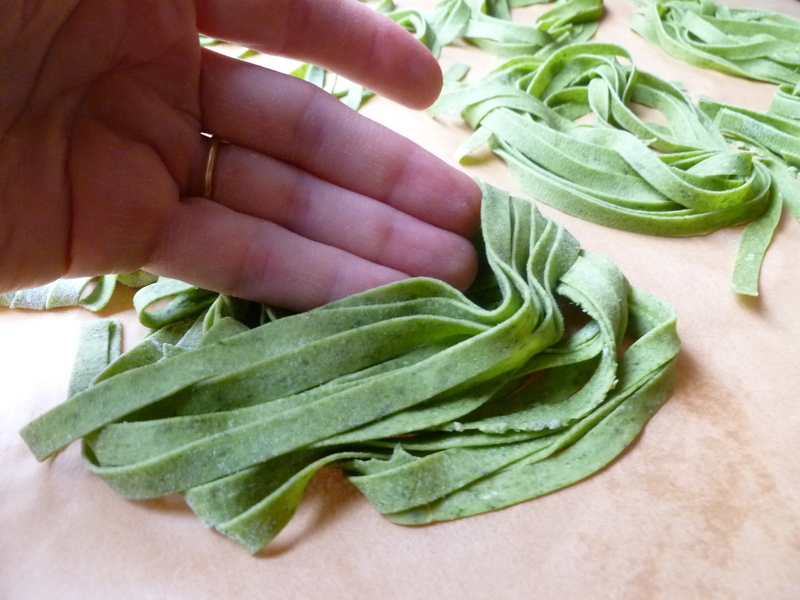 It is a lucid, well-written introduction to making pasta at home. The section on Pasta and Polenta in Alice Waters’ book The Art of Simple Food (2007) also is a useful introduction to pasta making. 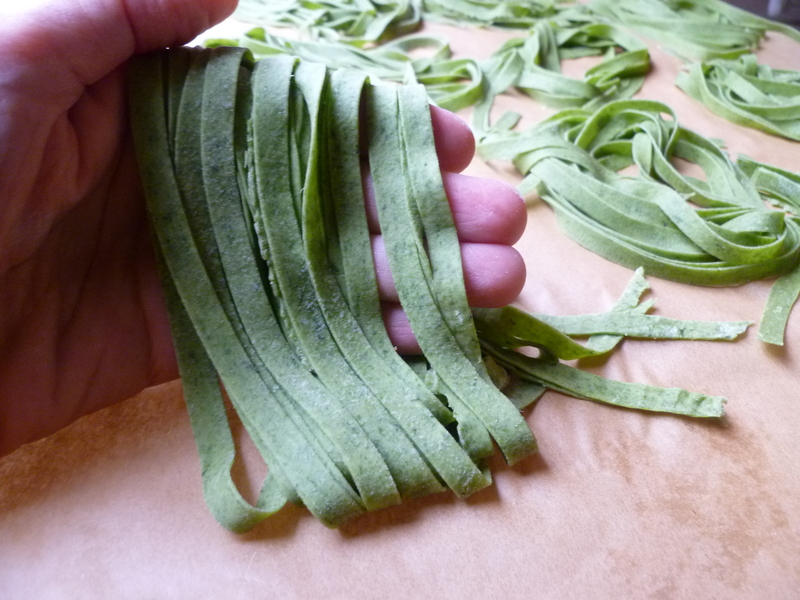 A Second Note: For anyone wishing to make pasta without using a machine, here is a good step-by-step video at ‘Pasta Recipes Made Easy’, a website devoted solely to the subject of pasta. I’m more than happy to find this page. I need to to thank you for ones time for this wonderful read!! I definitely appreciated every bit of it and i also have you saved as a favorite to see new information in your blog.